With the lean season reaching its peak, many villages in Zimbabwe have already exhausted their staple grain reserves. 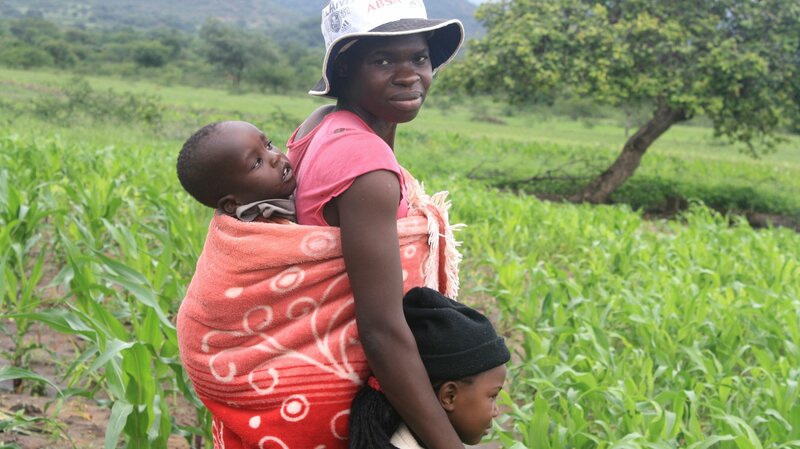 The most recent Zimbabwe Vulnerability Assessment Committee (ZimVAC) report projects that at least two million people, out of a population of 13 million, will be without sufficient food until the end of March. But had they had access to high-quality rain forecasts for their areas, communities could have better prepared for the period between harvests, experts say. Lack of information about the rains is a common problem in Africa, one expected to grow more serious as the climate changes, making weather patterns more erratic and making the need for micro-level information even more imperative. The road to Zimbabwe’s hunger hotspots winds past villages with plots of healthy maize. Residents in these areas say this is the best rainfall they have seen in at least four years. “But I hear the villages down in the Sipamphi area [20km away] did not get good rainfall. They need food,” said Sylvia Zihove, who runs her own small farm. Further down the road are fields of stunted, and even rotting, maize. Eugenia Musakanda, a resident in Sipamphi, is a single mother of two children, one of whom is disabled. Her community had only heard - from a report on the radio - that they might have good rains this year. She left her children in her mother’s care to spend weeks at other farms as a labourer, ploughing fields in exchange for maize and money. She returned, planted her field and waited. She now faces ruin. To make matters worse, her family and the approximately 50 households in the area have no aid to help them cope. One of the NGOs that had been delivering food provided by the World Food Programme (WFP) has stopped distributions because the UN agency does not have sufficient funds to respond. Katharine Vincent, the director of Kulima Integrated Development Solutions, a climate-change adaptation consultancy, says she often comes across accounts of micro-scale variations in the rains in Southern Africa, where she works. Vincent is a lead author of a chapter of the forthcoming report of Working Group II of Intergovernmental Panel on Climate Change (IPCC), which deals with climate change impacts, vulnerability and adaptation; the report is expected to be launched in a month. "There is, of course, a danger in sending out a message saying that rains are likely to be better than average in one year, when villages so close to each other experience such different conditions"
Musakanda also said that, had she received more accurate information about the rains in her area, she would have been better prepared to handle the poor growing conditions. A number of projects run by NGOs in Africa are trying to better communicate weather information at the community level using mobile phones, said Vincent. “But of course a major limitation of seasonal forecasts and the like is their inability to take into account such micro-scale variations. And there is, of course, a danger in sending out a message saying that rains are likely to be better than average in one year, when villages so close to each other experience such different conditions,” she explained. But weather forecasts and climate science are not yet advanced enough to make micro-scale predictions with great accuracy. Therefore, any information must be “accompanied by appropriate awareness-raising on its limitations, or else we run the risk of overreliance, and then a backlash when it inevitably doesn’t predict the right conditions with 100 percent accuracy”, Vincent added. A recent conference of the Coordinated Regional Climate Downscaling Experiment (CORDEX) addressed the difficulty of communicating uncertainty to lay people. CORDEX aims to downscale climate change projections to almost the village level, but there remain significant challenges, said Maarten van Aalst, director of the Red Cross/Red Crescent Climate Centre and a coordinating lead author of the IPCC’s special report on Managing the Risks of Extreme Events and Disasters to Advance Climate Change (SREX). Van Aalst says the scientific community must keep the end user’s needs in mind when interpreting information, not “just in terms of providing a better definition of impacts but actionable information to inform decisions”. For example, Musakanda, the farmer in Zimbabwe, might benefit from information about climate-resilient seeds rather than just information about rains in her village. Paddington Zhanda, Zimbabwe's deputy minister of agriculture, told IRIN the country could use support in developing its climate information services. But he added that the government is already supplying regions that traditionally receive erratic rains with climate-resilient seeds. "We are also encouraging those regions to grow small grains such as sorghum, which are much hardier crops." The government, he said, supplies seeds to at least 1.7 million households. The Global Framework for Climate Services (GFCS) has just launched the Climate Services Adaptation Programme in Africa, which aims to build resilience in disaster risk management, food security, nutrition and health. It includes, among other efforts, the development of climate services tailored to the practical needs of communities. Van Aalst, explained that the issue is not just to provide information at the local scale, but also at the relevant timescales, and this where GFCS steps in. "Doing something to avoid negative consequences would require information about the next days, weeks or months from regular weather forecasts or seasonal climate forecasts"
Sofie Sandström, the coordinator of the programme at the World Meteorological Organization, said the programme will initially target two countries: Malawi and Tanzania. It will build on existing community-level initiatives run by other agencies, such as WFP and the Red Cross. Climate information will be circulated through farmer field schools, radio, SMS services and other mechanisms. At the same time, agencies will work with government officials to help them understand and communicate the information. “Whether users pay for climate information or receive it for free depends on the information and user in question, but for the communities targeted by the Red Cross and WFP, there will not be any fees charged for obtaining information,” Sandström said. The information should help farmers plan planting and marketing strategies based on seasonal climate forecasts, and also help disaster risk managers better prepare for droughts and heavy rains. It should help public health services target interventions to limit climate-related disease outbreaks such as malaria, and improve the management of water resources. Sandström hopes that, if successful, the model could be replicated in other countries.